Under catch shares, fishermen have a strong incentive to become stewards of their fishery because they benefit directly from conservation practices, better monitoring, and improving information about stock conditions. A new study also confirms there is a positive change in incentives towards better compliance under catch shares management. Last week, Marine Policy released a study by the Environmental Law Institute (ELI) analyzing the relationship of enforcement and compliance behavior in the Gulf of Mexico Reef Fish Individual Fishing Quota (IFQ) program, a catch share program implemented in 2007. The goal of the study was to better understand how catch shares management affects enforcement and compliance behavior. 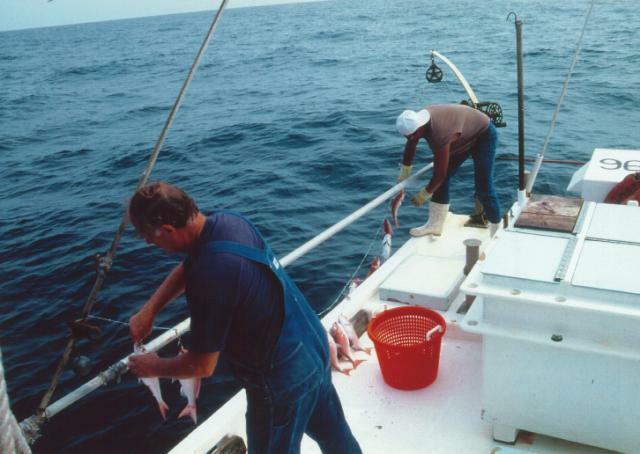 Enforcement records and fishermen surveys were used to compare enforcement practices and cases of noncompliance five years before and after IFQ implementation. The results of the study show that compliance has improved under the IFQ program. Over the past five years, the total number of violations has decreased. The analysis also reveals shifts in the type of violations detected: Violations pertaining to permits, illegal sales, closed seasons and catch limits have decreased, while reporting and record keeping violations have become more common following catch share implementation. The reduction in overall violations is good news and the increase in recordkeeping violations were anticipated as fishermen adjusted to new landing and reporting rules. These types of violations are generally easier to correct: ELI recommends increased dockside enforcement to deter inaccurate landing records and solidify improved compliance. These findings are consistent with the findings of an earlier analysis co-authored by EDF and featured in Marine Policy, which found that compliance with catch limits improved dramatically in 15 North American fisheries that converted to catch shares. By better ensuring compliance with scientifically-set catch limits, catch shares are helping our fisheries recover. This entry was posted in Gulf of Mexico and tagged Catch Shares, fishing compliance, Marine Policy. Bookmark the permalink. Both comments and trackbacks are currently closed.